a local market followed by a visit to the temples. There you learn how the ritual offerings found in Balinese ceremonies are made. To round off your hands-on experience, you will have the chance to prepare a few Balinese culinary specialties. "Bali, ""the island of the gods"" reveals its magnificent beaches, volcanic landscape, rice fields carved into the hillsides and forests to the visitor in search of discovery. 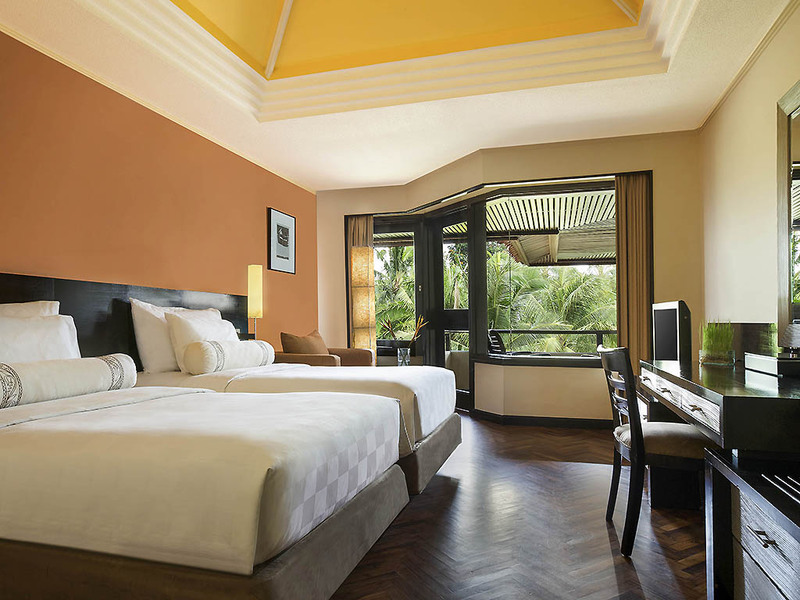 The Royal Beach Seminyak Bali rises up out of the water in the heart of 4.5 .. The hotel is a hidden treasure in a natural environment, whether it is seaside, country side, mountain, or urban retreat. From Ngurah Rai international airport take a taxi and follow the signs to Seminyak. From Seminyak, follow the signs to Camplung Tanduk Street formerly Abimanyu Street which runs along Seminyaks popular main beach area. The hotel is located opposite GadoGado Restaurant. 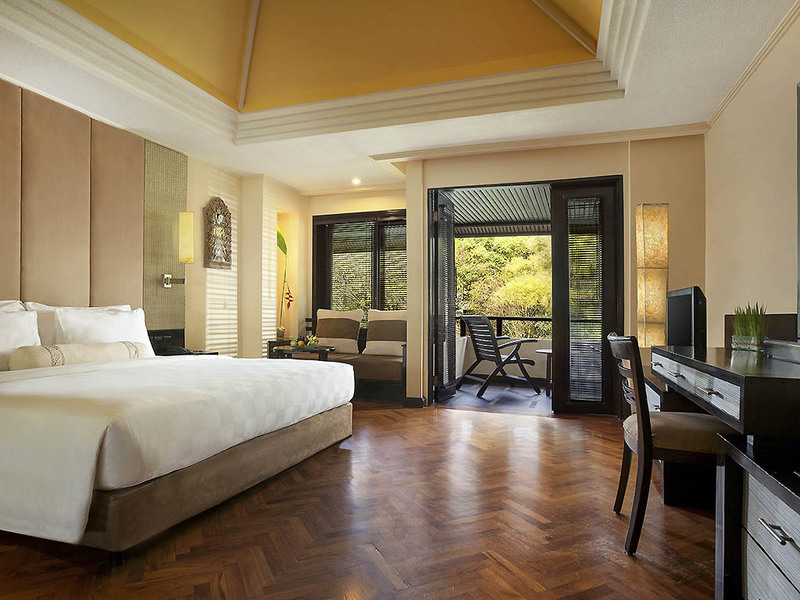 The Royal Beach Saminyak Bali MGallery by Sofitel is 20 minutes drive from the airport. Comfortable 420 sq.ft. (39 m²) room with unique design, featuring 1 king size bed, private balcony with tropical garden view, LCD TV, free high-speed Internet and WIFI, mini bar, sofa and coffee table, safety box, tea and coffee facilities. Comfortable 420 sq.ft. (39 m²) room with unique design, featuring twin beds, private balcony with tropical garden view, LCD TV, free high-speed Internet and WIFI, mini bar, sofa and coffee table, safety box, tea and coffee facilities. Spacious 484 sq.ft. (45 m²) uniquely designed room, featuring 1 king size bed, private balcony with tropical garden view, LCD TV, free high-speed Internet and WIFI, mini bar, double sofa and coffee table, safety box and tea/coffee making facilities. Spacious 484 sq.ft. (45 m²) uniquely designed room, featuring twin beds, private balcony with tropical garden view, LCD TV, free high-speed Internet and WIFI, mini bar, double sofa and coffee table, safety box and tea/coffee making facilities. A large luxurious 550 sq.ft. 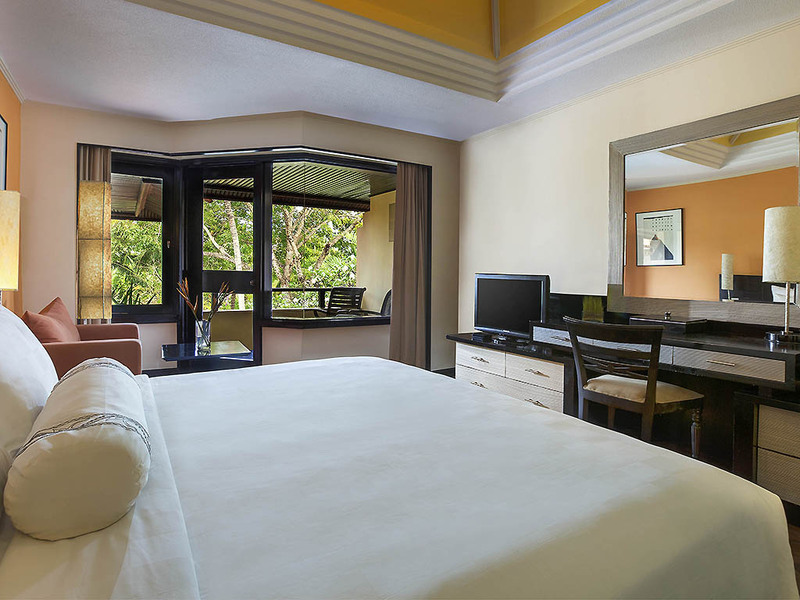 (51 m²) room with 1 king size bed, a long sofa and coffee table in spacious area, private balcony with tropical garden view, LCD TV, free high-speed Internet and WIFI, safety box and tea/coffee making facilities. Private villa of 2,800 sq.ft. 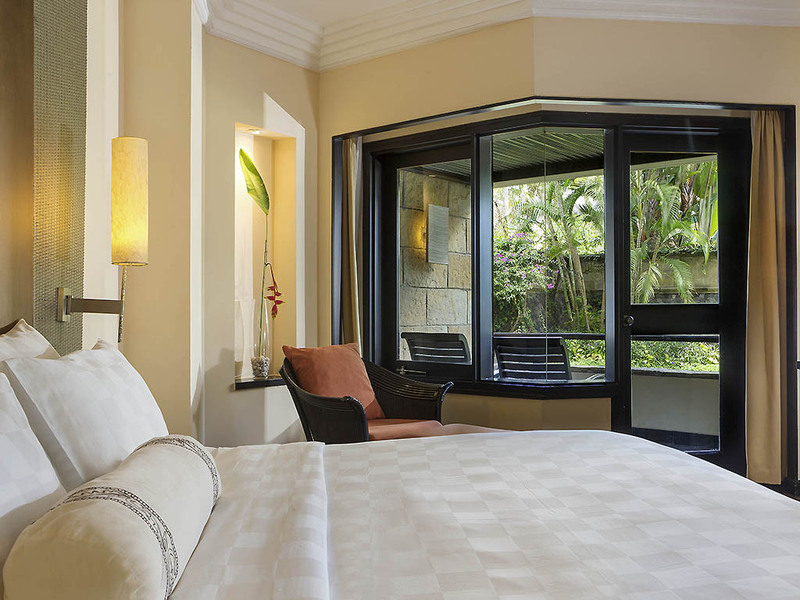 (260 m²), featuring 1 king bed or twin beds, free high-speed WIFI Internet, coffee machine, private pool/Jacuzzi tucked in private garden, sundecks, living area, traditional outdoor day bed, and butler service. 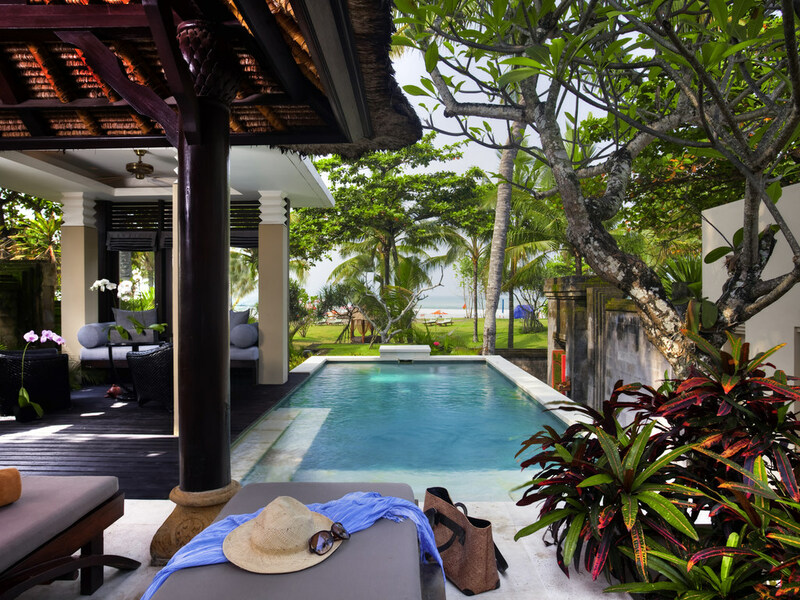 Private villa of 260 m² facing the Indian Ocean, featuring 1 king bed, free high speed WIFI Internet, coffee machine, private pool/Jacuzzi tucked in a private garden, sundecks, living area, traditional outdoor day bed, and butler service. Villa in a private 4,036 sq.ft. (375 m²) area, featuring 1 king bed and twin beds, free high-speed WIFI Internet, coffee machine, private pool/hot tub tucked in private garden, sundecks, living area, traditional outdoor day bed, and butler service. From a selection of the finest Indonesian dishes, through a wide range of mediterranean food and Japanese live cooking, the resort offers memorable gastronomic experiences. Unmatched sunset and signature cocktails are the perfect equation to prolong your day. activities. The spectacular surroundings and attentiveness of our team will surely impress all delegates, making each event successful and memorable. Enjoy your special day against the magical backdrop of the Indian Ocean and diamond stars. 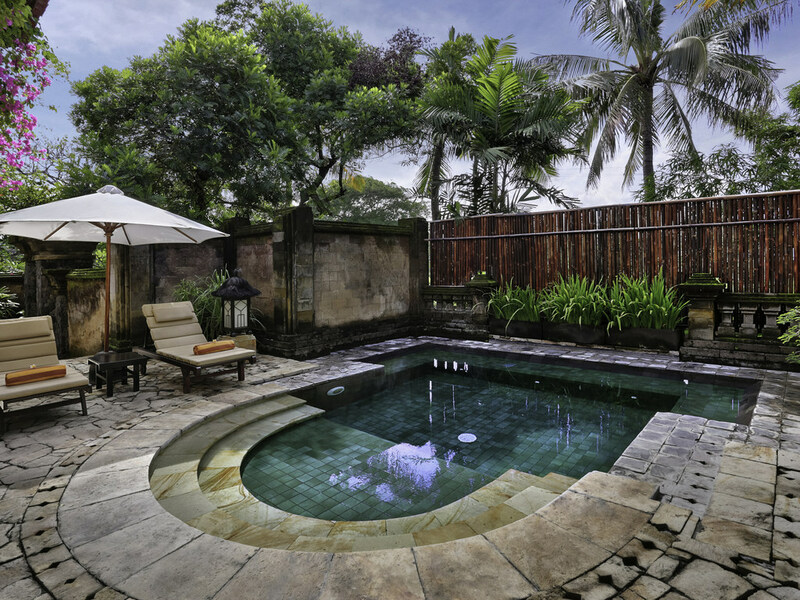 The lush tropical gardens and amazing Balinese ambience provide an idyllic setting. Such a wonderful way to start your new life together as a couple! Le Spa offers a wide range of relaxing and indulgent therapies. Comprising five treatment rooms, Le Spa is staffed by an expert team, each of whom provides unique insight into the therapeutic traditions of Indonesia.